We answer some common questions about electricity supply. Electricity lights up your world. But sometimes you feel all in the dark when it comes to your legal rights. Here are the answers to some common questions about electricity supply. Complaints about electricity can be made to Utilities Disputes (formerly known as The Office of the Electricity and Gas Complaints Commissioner). This is a free service that deals with complaints from consumers about electricity and gas companies. Our Powerswitch help page has more information. I switched companies 3 months ago, but haven't received a bill yet. I'm concerned that I'll get one big bill that I won't be able to pay. Although you are obliged to pay your bills, it is up to the power company to ensure it sends you bills within a reasonable timeframe. Once the bill does arrive, if you can't afford to pay all at once, tell the power company you will pay by instalment. You should receive a discount from the company when bills are very late. One way to avoid an unmanageable bill — it will eventually turn up — is to put some money aside each month for electricity. That way, when you finally receive your bill you will be in a good position to pay it off with a minimum of hassle. My estimated account is much higher than my actual accounts. Do I have to pay it? Electricity companies usually only send someone around to read the meter every second month. Although power companies bill their customers monthly, they usually only send someone around to read the meter every second month. In each intervening month they send you an estimated account, based on your consumption over the previous years. If you have good reason to think the estimated account is too high, send a cheque to the company for what you think is fair, together with an explanation. If you know how, you could read the meter yourself. Many electricity companies let you tell them the meter reading and they will send out an accurate bill. If your estimated accounts remain persistently inaccurate, complain. There may be a bug in the system. My meter is playing up, and the power company says I have to pay to have it repaired. Is that right? You may have bought your own meter. The meters were sold by the line company to the existing energy retailer. If you switch retailers, your original supplier may continue to own the meter, or it may sell it to your new supplier. The meter is owned by the line company. The meter is owned by an independent meter company. 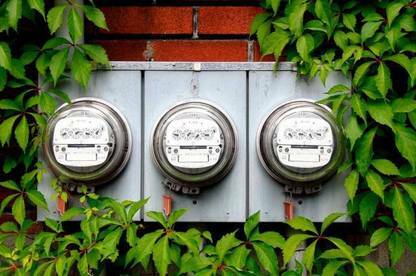 If you are unsure who owns your meter, ask your energy retailer. Whoever owns the meter is responsible for maintaining and repairing it. However, you must take all reasonable steps to ensure the meter is not interfered with or damaged. If you believe the meter is not accurately measuring your electricity consumption, complain to your retailer. You usually must pay to have the meter tested (around $50), but if it turns out the meter is not up to standard, you should get the money back. The electricity company says I have to pay to clear the trees around the electricity lines. Is that right? The line company owns the lines along the street (whether strung on poles or underground). At your property, there is a "point of connection" which is where your cable joins the line company's cables, usually at the boundary of your property. You own the cable from the point of connection to the meter box, and are responsible for keeping this line properly maintained and safe. If a tree on your property is encroaching on power lines, don't try to tackle it yourself. Contact the lines company; it will check the tree and issue a "cut and trim" notice if necessary. It's then your responsibility to ensure that the tree is cut or trimmed. The lines company will pay for the first cut and trim; after that you have to pay. Bear in mind that the company's priority is to remove trees or branches presenting hazards so, if you want a trim that is sympathetic to a particular species, you may have to make special arrangements. If the lines company doesn't own the power lines - if, for example, they're on farmland or in a private accessway - then it's the landowner's responsibility to ensure trees are kept clear of the lines. Work on trees near power lines should always be carried out by a properly equipped and qualified arborist. If your line develops a fault or is damaged, you can ask the line company (either directly or via your energy company) to fix it, but the line company may charge you. You don't have to use the line company, you can get an electrical contractor to do the job. Your lines may be covered by your house insurance: check with your insurer. There's a power pole beside my driveway that fell over in the last storm. It appears to be rotten at the base. The line company says I have to pay for a new pole. Is this right? It's likely that you have to maintain the lines and poles on your property, but there's no straightforward answer. The responsibility for such repairs and replacements depends on several factors. We strongly suggest that you refer the matter to Utilities Disputes.